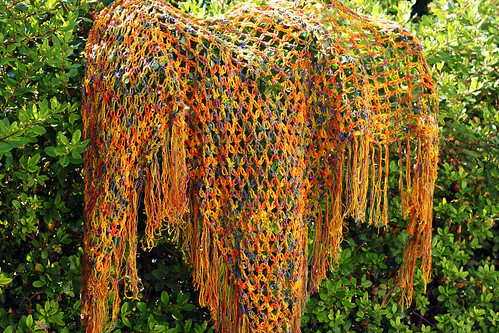 I used the pattern “Gypsy Wrap” in the little “Vogue Knitting Crocheted Shawls” book for this drapey shawl. It reminds me of the hippie 60’s in the daffodil color-way. The yarn is a hand-dyed rayon boucle by Blue Heron. I had trouble photographing the shawl, since it is so bouncy. That is why it is draped on the hedge. The elongated lover’s knot stitch is fun to do. I used two strands of yarn held together matching the colors as I crocheted. I only had about 6″ of yarn left. I measured out the fringe first then crocheted until the yarn was all used up. 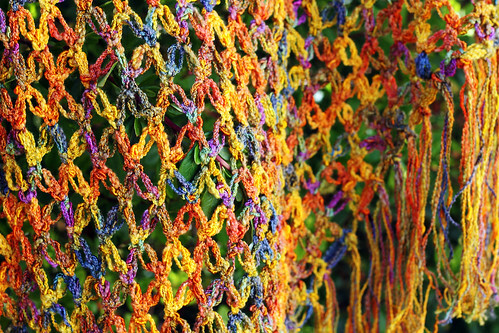 This entry was posted on Friday, August 21st, 2009 at 3:00 am and is filed under Crochet. Tagged: Crochet. You can feed this entry. You can leave a response, or trackback from your own site.